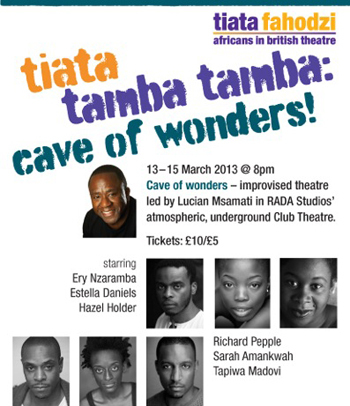 Tiata Fahodzi presents improvised theatre led by Lucian Msamati in RADA Studios' atmospheric, underground Club Theatre. Performers: Ery Nzaramba, Estella Daniels, Hazel Holder, Tapiwa Madovi, Richard Pepple, Sarah Amankwah. Improvised theatre in the atmospheric, underground Club Theatre at RADA Studios. Workshop with Lucian Msamati on improvised theatre skills for actors. Participants must be prepared to work practically and should come dressed appropriately. Please call 020 7307 5060 to book your place (not bookable online).